How to engage and inspire stu­dents? One potent tech­nique is to take them out of the class­room. Bernadett with stu­dents on walk­ing archi­tec­tur­al tour. Gas­town, Van­cou­ver, BC. When I decid­ed to make field trips an essen­tial ele­ment of every class I teach, my stu­dents imme­di­ate­ly saw the rela­tion­ship of the class with real­i­ty. It would be wast­ed oppor­tu­ni­ty not to intro­duce stu­dents to the his­to­ry of Van­cou­ver. I took my class on a his­tor­i­cal walk­ing tour, con­nect­ing my train­ing as a tour-guide with my knowl­edge of his­to­ry of design and Van­cou­ver build­ings. 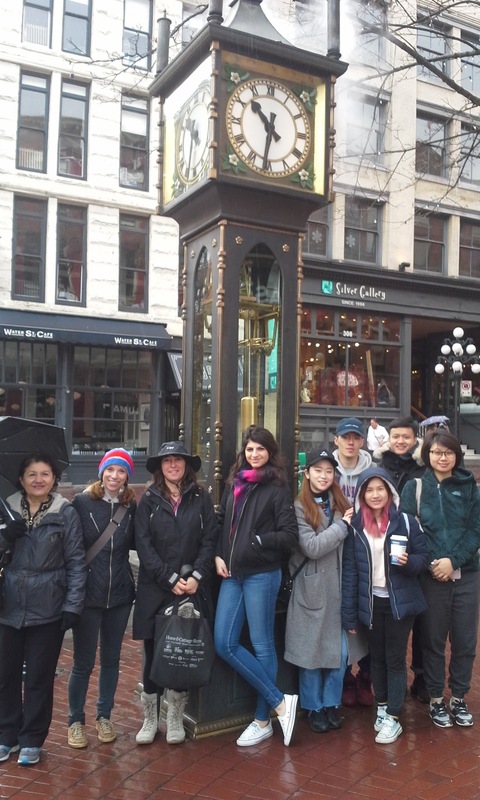 Engag­ing with the city they live in is one of the rea­sons stu­dents choose to study in Van­cou­ver. My role is to cre­ate oppor­tu­ni­ties for stu­dents to cre­ate deep­er learn­ing. Stu­dents apply their the­o­ret­i­cal knowl­edge from my his­to­ry of archi­tec­ture and design class, as soon as they get the chance to phys­i­cal­ly vis­it build­ings with his­tor­i­cal ele­ments and details. How do they apply their knowl­edge? Stu­dents are ready to learn and engage with their sur­round­ings. They are hap­py to work with me, and fol­low my lead when I point out details, and evi­dence of life in the past. As they walk through the neigh­bour­hoods, they take their time to look at the build­ing ele­ments, inter­act with the city, and engage in con­ver­sa­tion, sketch­ing activ­i­ties, and cre­ate life-long mem­o­ries. That is how to inspire, sup­port and care for stu­dents. Pro­vid­ing active-learn­ing chances, is what makes edu­ca­tion a life long jour­ney, and what makes stu­dents keep com­ing back for more. Adding that per­son­al care, atten­tion and sup­port is essen­tial to their expe­ri­ence and makes the instruc­tor their men­tor, and life-long coach.